After Kiel beat Szeged 29:22 in the opening match of the VELUX EHF Champions League Last 16 on Wednesday, 10 more teams will be in action on Saturday and Sunday when the first leg will be completed. 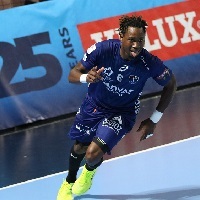 Playing at home, Montpellier (in the ehfTV.com Match of the Week against Barcelona), Skjern and Kristianstad are out for a surprise. Can Montpellier cause another upset? One year ago, the Champions League winners from 2002/03 became the first ever team from Groups C/D to proceed to the quarter-finals. And Montpellier did so in style - by eliminating defending champions Kielce in the Last 16. Now the side of Patrice Canayer are out for another sensation - against the record winners. In their most recent duels, in the 2015/16 season, Montpellier were taught two clear lessons by Barcelona. In the 2011/12 Last 16 games, the results were closer as Montpellier won 30:28 at home before being routed 36:20 at Palau Blaugrana. The pairing is extra spicy as Barcelona right back Jure Dolenec played for Montpellier until last season, while French top line player Ludovic Fabregas will join the Catalan side next season. Either Brest or Nantes will make their debut in the VELUX EHF Champions League Quarter-finals. While the French side are in their second ever Champions League season, the Belarusian champions are part of the Last 16 for the third time. In the previous two seasons, both clinched their Last 16 berth by winning a Group C/D play-off. Nantes were the big surprise pack in the group phase as they beat defending champions Vardar Skopje and record winners FC Barcelona and finished third in Group A.
Brest had some shaky weeks during their campaign before grabbing the final Last 16 ticket in Group B. While Nantes were eliminated by eventual finalists Paris SG last season, Brest were edged by Flensburg. The current top scorers of both sides are separated by only two goals: Brest’s Petar Djordjic (59) and Nantes’ Eduardo Gurbindo (57). Thanks to their home strength, Brest might be favourites in the first leg. The aggregate winner will face the winner of Skjern vs Veszprém in the quarter-final. Booking their ticket for the Last 16 has already been the biggest international success for Swedish champions Kristianstad. The team of head coach Ola Lindgren won away at Zagreb in their final group match to advance to the knockout stage for the first time. Flensburg, the 2014 Champions League winners, are favourites to come out on top. Their Swedish players Mattias Andersson, Tobias Karlsson, Hampus Wanne and Jim Gottfridsson will enjoy the trip back home, where thousands of frenetic fans will create a great atmosphere. Flensburg finished third in Group B, trailing PSG and Veszprém. Only once - against Kiel in 2014/15 - they have been eliminated in the Last 16, the other 10 times they made it to the quarter-finals. The winners of this duel will take on either Montpellier or Barcelona in the next round. Löwen have failed in the Last 16 in each of the past three seasons - against Szeged, Zagreb and Kiel, respectively. The last time the German champions made it to the quarter-finals was in 2014, when they eliminated Kielce. It was the international debut of Talant Dujshebaev as coach of the Polish champions. Three former Löwen players are in the Kielce squad - Slawomir Szmal, Karol Bielecki and Krzystof Lijewski. They were all part of the Kielce squad that won the Champions League in 2016. After a shaky start in the group phase, Kielce improved and finished fifth in Group B. They remained unbeaten in four matches against German opponents this season: they beat Kiel twice and draw twice with Flensburg. Both sides are clearly dominating their domestic leagues. The winner will face Paris Saint-Germain in the quarter-finals. Veszprém hope to make history this season as no team so far have qualified for the VELUX EHF FINAL4 five years in a row. The Hungarian side have been part of the marquee event each year since 2014, and they seem to have a reasonable chance to book the trip to Cologne again this season. If they overcome Skjern, they will meet Nantes or Brest as the final obstacle on their way to the LANXESS arena. Skjern are appearing in the Last 16 for the second time. In the 2003/04 season, they were clearly beaten by SC Magdeburg. One of Skjern’s new arrivals, Anders Eggert, will be pitted against his former coach, Ljubomir Vranjes. Both raised the Champions league trophy with Flensburg in 2014. While Skjern beat Zaporozhye in the Group C/D play-offs, Veszprém qualified for the Last 16 by finishing second in Group B.